Toshiba America Business Solutions today announces the availability of 10 newly designed and engineered e-STUDIO™ line of multifunction printers (MFPs). The latest Toshiba MFPs include six color (e-STUDIO7506AC series) and four monochrome (e-STUDIO8508A series) models, which are all designed to connect, integrate and simplify the workplace. Advanced software and hardware features integrated throughout the products enable users to tackle nearly any print, document management and workflow application. The powerful multi-core Intel® Atom™ processor, a customizable tablet-style user interface (UI), Embedded Application Platform and Dual-Scan Document Feeder (DSDF) highlight Toshiba’s product portfolio. Toshiba’s customizable 9-inch tablet-style UI facilitates a more intuitive user experience. The latest e-BRIDGE™ Next controller, combined with the new UI, gives users the flexibility and power to accommodate their unique workflow needs. 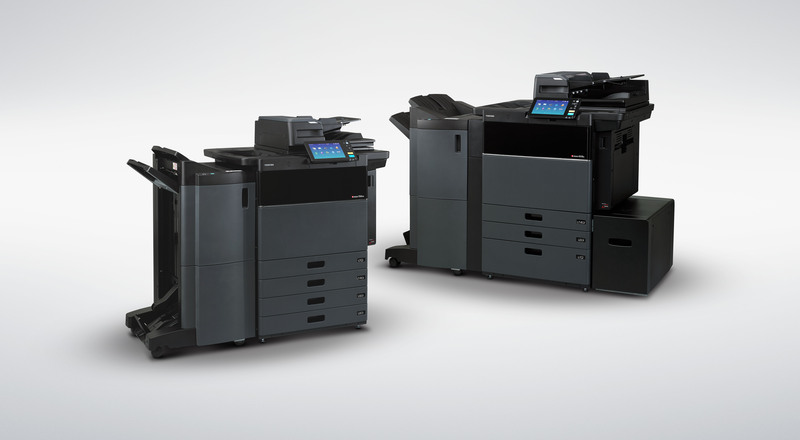 Toshiba’s new MFP line also reflects its commitment to a more sustainable planet. The company’s 10 new e-STUDIO models meet the stringent criteria of major environmental programs and standards, such as EPEAT® Gold, Restriction of Hazardous Substances (or RoHS) and ENERGY STAR®. Toshiba’s latest e-STUDIO products are available – starting at $24,176 – via the company’s array of authorized dealers. For more information about Toshiba products, or to locate an authorized Toshiba dealer in your area, visit www.business.toshiba.com.